Kettlebell athletes realize early on that hand care is essential for comfortable kettlebell training. Callouses at the base of your fingers, where the handle rubs as it passes across your hand, can wreck havoc if left unattended. Here is a quick run-down on some products and procedures that should help make your callouses a non-issue when using kettlebells. First, callouses are a result your hands repeatedly coming into contact with iron kettlebells. Removing callouses entirely is not our goal as we need them to protect that area of the hand when we lift, swing and move the kettlebell. However, if callouses become too mountainous, they can rip and/or blister and that can result in blood and discomfort -- not to mention time where you are unable to use kettlebells at all. So prevention is essential on a weekly, if not daily basis. If you are using good form, and doing moderate kettlebell training, your callouses might not be an issue. But as you progress, and do more kettlebell training (Snatches especially), the handle of the bell repeatedly hitting the callouses can increase the size of the callous significantly. As you advance in your kettlebell skills, you may be able to adopt techniques to bypass the callouses by throwing the bell from your palm directly into your fingers. Talk to your coach about these techniques. This is the simplest way to manage callouses. 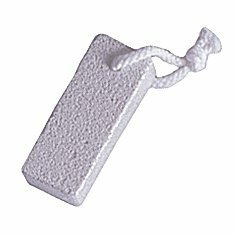 After a shower or bath, sluff off the top layer of skin on the callouses using a pumice stone. The local drug store sells them for $3-5. Use this daily. Corn Huskers oil-free lotion softens and toughens skin. It smells good and is very inexpensive. Popular with farmers and lumberjack, why not Corn Huskers Lotion for hard-working kettlebell folk too? Ha, ha, love this stuff, but my hubby hates the smell. This old-time greasy gel-lotion comes in a metal container and is great to soften callouses overnight. It's other use is to "keep dairy cows utters from becoming chapped." My hands, cows utters, what's the diff? Soft as silk with Bag Balm. This is the most controversial recommendation. It is a foot callous shaver that contains a small razor blade. It is perfectly safe to use if you have first softened the callouses in the shower. If you do it right after a shower or bath, the shaver easily takes off only the top layer of skin with a single pass. I do this a couple times a week. If you do it with hands that have not been softened, it takes off more layers of skin than you will want and your risk bleeding or making your callouses raw. So please follow this advice strictly; only use it after softening your callouses. I learned the hard way even though I was also forewarned. This costs about $5 at the drugstore. Horrible name, but AMBP is a great product. Thanks to Chris Meredith for introducing me to this when I was training for my first KB cert. It is less gritty than chalk and it helps keeps hands dry -- which helps prevent further callous growth. You can trim the tops off new tube socks (old ones lose elasticity) to cover the callous areas when you do a lot of kettlebell work. Dragon Skins are another option that were very popular at the certification event I attended. I ordered a leather pair of callous protectors recently from a guy on KickStarter. They worked pretty well when I did 100 Snatches the other day. Having them sized correctly is critical so they don't slip and slide. A friend's dad made me a pair similar to these a while back, but they were a little big and moved around too much, so measure your hand carefully. Care for your hands and get the most out of your kettlebell training -- you will be glad that you did.